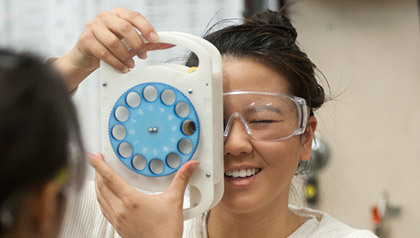 The VisionFinder, created by senior Jackie Lim, Frank Mai ’15, Natalya Shelby ’15 and Rose Hong Truong ’15 for their biomedical engineering senior design project, works like a phoropter, the optometric diagnostic device. The full-scale phoropter shows the patient a variety of prescriptions while the optometrist asks for feedback on which looks best. The VisionFinder works in the same way, except that it’s contained in a plastic shell light enough to be held by a small child. A reel on the front — reminiscent of the image disc in the classic View-Master toy — is rotated to move a dial containing different lenses to find the optimal prescription. The patient holds the VisionFinder and looks through a small hole to see which option looks the clearest. Aside from the obvious size difference, the VisionFinder also differs vastly in cost. A phoropter can cost thousands of dollars, while the VisionFinder prototypes were made for about $80 each — a figure Truong said she expects would drop if the device were mass-produced. It also doesn’t require batteries or electricity, which could be especially helpful in remote locations or developing countries. The team — dubbed Vision Vanguard — has taken the device on a trip to Mexico with volunteers from Liga International, as well as to a clinic in San Jose. Prototypes are being used in India and New York. The device also won the $3,000 Poverty Alleviation Award during the Graduate School of Management’s 2015 Big Bang! Business Competition. Rose Hong Truong ’15 was there, in Ecuador, as a UC Davis freshman spending a quarter abroad. A group of medical students from other universities had set up a makeshift clinic, but it was closing — and all the optometry equipment had been packed away. There were plenty of glasses, but no way to test the man’s vision to determine his prescription.